ABSTRACT: The Chickahominy Formation is the initial postimpact deposit in the 85km-diameter Chesapeake Bay impact crater, which is centered under the town of Cape Charles, Virginia, USA. The formation comprises dominantly microfossil-rich, silty, marine clay, which accumulated during the final ~1.6myr of late Eocene time. At cored sites, the Chickahominy Formation is 16.8-93.7m thick, and fills a series of small troughs and subbasins, which subdivide the larger Chickahominy basin. Nine coreholes drilled through the Chickahominy Formation (five inside the crater, two near the cratermargin, and two ~3km outside the crater) record the stratigraphic and paleoecologic succession of 301 indigenous species of benthic foraminifera, as well as associated planktonic foraminifera and bolboformids. Two hundred twenty of these benthic species are described herein, and illustrated with scanning electron photomicrographs. The Chickahominy Formation can be categorized as a single benthic foraminiferal biozone (Cibicidoides pippeni Biozone), subdivided into five subzones, in stratigraphic order from bottom to top: Bulimina jacksonensis Subzone; Lagenoglandulina virginiana Subzone; Uvigerina dumblei Subzone; Bolivina tectiformis Subzone, and; Siphonina jacksonensis Subzone. Two planktonic datums and four benthic datums provide a biochronostratigraphic framework in which to estimate the duration and temporal distribution patterns of discrete microfossil assemblages. Apaleoseral succession from pioneer to equilibrium paleocommunities reflects the temporal and spatial evolution from early unstable benthic paleoenvironments to later stable benthic paleoenvironments. Initial reoccupation of the newly formed crater basin is marked by a dramatic immigration of 32 indigenous species, which replaced the sparse, entirely reworked (allochthonous) foraminiferal assemblages of a preceding inhospitable dead zone. At all nine core sites, attainment of benthic paleoenvironmental equilibrium (29-190kyr postimpact) is signaled by a notable reduction in the number of new immigrant species arriving in the Chickahominy basin. In addition, at five sites inside the crater, early unstable benthic paleoenvironments can be differentiated from later stable benthic paleoenvironments by the presence of an agglutinated Psammosiphonella biofacies in basalChickahominy strata and a shift from short-term to long-term benthic foraminiferal generic dominance facies. 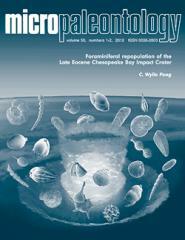 Restriction of the dead zone and Psammosiphonella biofacies to intracrater sites indicates unusual benthic paleoenvironmental conditions (warm, saline bottomwater and porewater) derived from the impact,which lasted as long as ~350kyr postimpact at one site.Absence of key planktonic foraminiferal and Bolboforma species in early Chickahominy sediments indicates that detrimental effects of the impact also disturbed the upper oceanic water column for at least 80-100kyr postimpact. Nine genera (Bolivina, Uvigerina, Gyroidinoides, Globocassidulina, Angulogerina, Nuttallides, Cibicidina, Caucasina, Epistominella) and two generic groups (buliminids, stilostomellids) are the most abundant taxa among 17 generic dominance facies that characterize Chickahominy core sites. Most dominant taxa were epifaunal or shallow infaunal opportunists, which thrived under conditions of oxygen depletion (dysoxia) and high organic flux rates. After an average of ~73kyr of stressed, rapidly fluctuating paleoenvironments,which were destabilized by after-effects of the impact,most of the cored Chickahominy subbasins maintained stable, nutrient-rich, low-oxygen bottom waters and interstitial microhabitats for the remaining ~1.3myr of late Eocene time.